0to300golf: Understanding Ball Flight: Why did the ball start there? Understanding Ball Flight: Why did the ball start there? If we are looking to become better golfers, a better ball flight helps. If we understand what is causing a ball flight we can make improvements. 1. Why did the ball start there? 2. Why did the ball curve that way? 3. Why did the ball go that far? If we know the answers to these questions, we can start to make changes and improvements. In this blog post we will look at the first question. Why did the ball start there? Where the ball starts is called Launch Direction. Launch Direction is defined by Trackman as the horizontal direction of the movement of the golf ball's center of gravity immediately after leaving the club face. There are five impact factors, club face angle, club path, angle of attack, club head speed and centeredness of strike. The main ones that affect launch direction are club path and club face angle. Club Path versus Club Face Angle? Club Face Angle has a much greater effect on launch direction than Club Path. An easy was to illustrate this is to hit a 20 yard chip with a 5 iron. First hit the chip to a target and watch where it starts and goes, then with a second shot aim the 5 iron face at a 45 degree angle to the left. Hit the chip shot with the same swing (keeping a similar path) as the first one, the ball will start a long way left, close to the 45 degree angle the club face was pointing, showing cub face angle has a much greater effect than club path. Club face angle accounts for approximately 85% of the launch direction for drivers and 75% for irons. Let's use an example to see what launch direction a club face angle and club path might produce for a 5 iron. For a club path of -6 degrees (minus values indicate to the left of the target, positive to the right) and a club face angle of 4 degrees the ball will start ((-6x0.25= -1.5) + (4x0.75 = 3) = 1.5), so with this path and face angle the ball will start 1.5 degrees to the right. Even though the path has a greater value, the face will have a greater influence on where the ball starts. The above photo from http://www.golfdigest.com/golf-instruction/2012-12/sean-foley-law-of-the-draw is a good illustration of club face influence on the launch direction. What influences Club Face Angle? Club Face Angle is the horizontal club face orientation at the center of contact between club face and golf ball at maximum compression of the golf ball, i.e. where the club face is pointing at the point of impact between ball and club face. This is slightly different to club face direction. Club Face Direction is the horizontal club face orientation of the center of the club face at impact. There is a roll and bulge on driver faces, i.e. the face is curved. This affects Club Face Angle on off center hits. Note the curvature of the face in the above photo. On off center hits the club face angle will differ from the club face direction. Toe hits have a club face angle more to the right and heel hits more to the left. Club Face Angle is a combination of Club Face Direction and impact point on the face. A heel shot may start on target if the club face direction offsets the club face angle at impact i.e. the club face direction is to the right. As there is no roll or bulge on an iron, this happens with woods and hybrids mainly. Swing Direction is the horizontal direction of the plane defined by the club head's center of gravity movement prior to impacting the ball. Looking at a swing through a camera this looks like the only factor that determined club path but attack angle and vertical swing plane also determine it. Attack Angle is the vertical direction of the club head's center of gravity movement at the maximum compression of the golf ball. How does this affect club path? As the club is travelling down it is moving from in to out and as it is moving upward it is travelling from out to in. So if you are hitting up on a driver a swing direction will need to be positive to balance out the the negative club path value of the attack angle and create a straight launch direction. 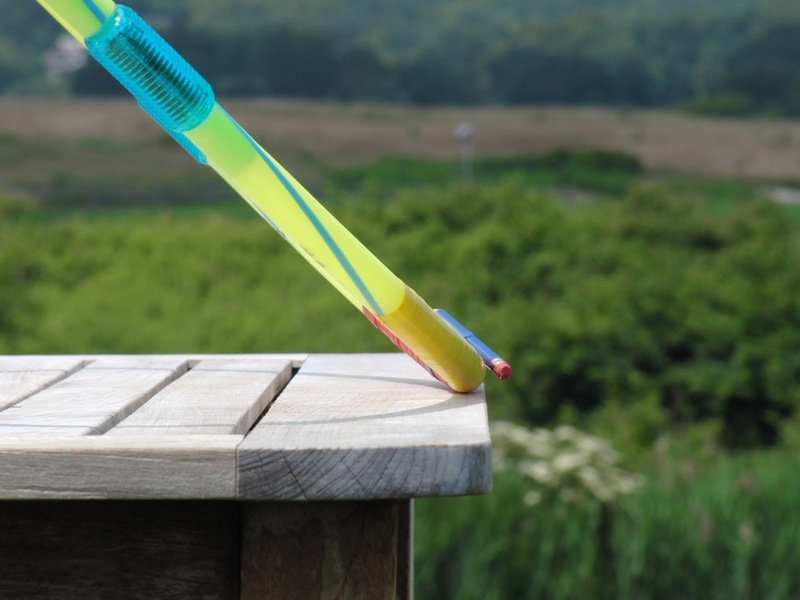 The hula hoop needs to be moved to the right to get the pencil pointing straight. The amount that the swing direction needs to be compensated for the attack angle is dependent on the vertical swing plane. For a driver the vertical swing plane is close to 45 degrees, for irons it averages around 60 degrees. For a vertical swing plane of 45 degrees (driver) we get a one to one relationship between attack angle and club path i.e. if the attack is -3 a swing direction of +3 will give a straight launch direction. For a vertical swing plane of 60 degrees (irons) there isn't a one to one relationship between attack angle and club path, it is approximately 57%, so for 1 degree of attack angle we get .57 degree of club path. With an attack angle of 4 degrees down we need a swing direction of 2.28 left to make a straight launch direction. Club Face Angle has the biggest influence on where the ball starts. 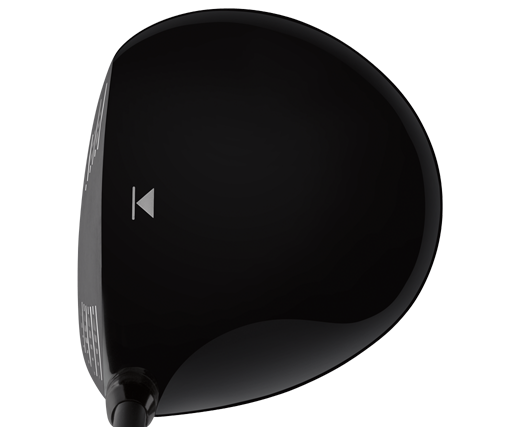 85% influence for drivers and 75% for irons. 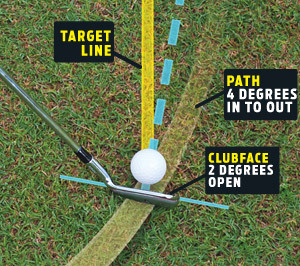 Club Face Angle is composed of club face direction and impact point. Club Path has some influence on where the ball starts. 15% for drivers and 25% for irons. Club Path is a combination of Swing Direction, Angle of Attack and Vertical Swing Plane. What this means is, if your ball is not starting where you want it to, the club face angle is the main reason for this. Change the club face angle and the ball will begin to start closer to where you want it to. Very interesting article. So you should be hitting slightly in to out for driver and out to in for irons assuming angle of attack is positive and negative respectively. Does this explain a little of why people who go over the top get away with on irons a lot more than on the driver ? Yes, for optimal driver play with an upward angle of attack, an in to out swing direction is required to have a neutral club path and vice versa for irons. Someone who is over the top could have a neutral path given a downward angle of attack but the shorter shafts of the irons, which are easier to control, would be the main reason why golfers who are over the top get away with irons rather than the driver.